“Our priority is to continue to care for the people infected with the Ebola virus,” Henry Gray, Médecins Sans Frontières (MSF) Emergency Coordinator, Guinea (18 April 2014). The latest outbreak of Ebola Zaire, which is ongoing, has now infected up to 230-persons and taken the lives of 142. 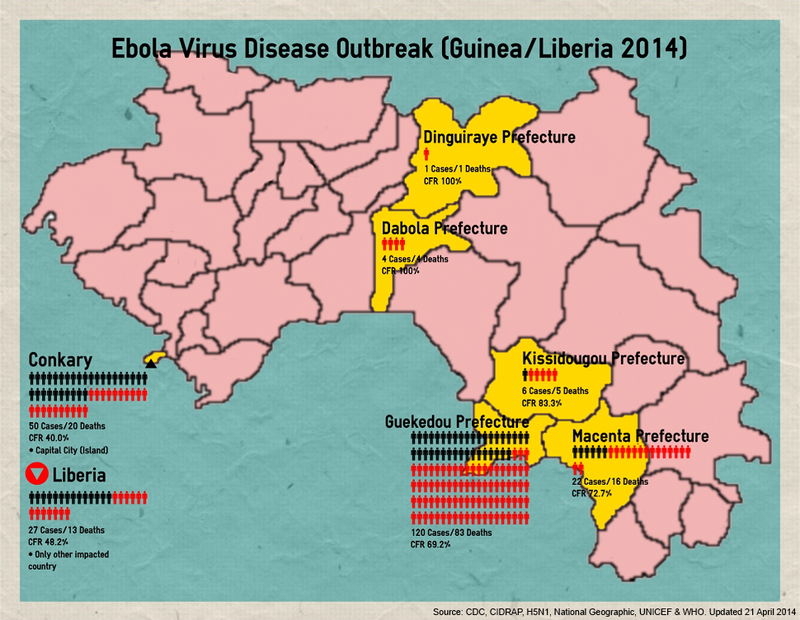 Guinea has borne the brunt of the disease with 203 infections (129-deaths) and Liberia 27 infections (13-deaths). Previously reported cases in Mali and Sierra Leone have shown to be negative. These numbers are still likely to change. The World Health Organisation has a comprehensive update issued on the 17 April 2014 (care of FluTrackers). The most impacted area of this EVD outbreak is in the Guekedou Prefecture with the outbreak spreading over the border to neighbouring Liberia. Notes: The map graphic was taken from public source data from Wikipedia (and amended). Acknowledgements:Data for this infographic was sourced from official reports from the World Health Organisation. I have also utilised resources from the CDC, CIDRAP, H5N1, Virology Down Under and National Geographic.